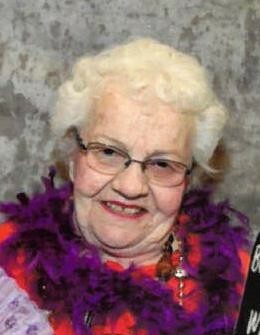 Funeral services for Lola Lind of Roseau will be held on Saturday, September 1, 2018, at 10:00 AM at Helgeson Funeral Home in Roseau with visitation one hour prior to the service. Interment will be at the Falun Cemetery. Lola passed away on Sunday, August 26, 2018 at the age of 90. Lola Joyce Lind was born on the homestead in Hampden, ND, on May 19, 1928, to Emil and Ella (Willis) Otto. She attended school in Hampden through the 8th grade, and then moved to Roseau County when she was a teenager. Lola married Elvin Lind in 1955 at the Moe Lutheran Church in Roseau. She farmed alongside Elvin in Cedar Bend township most of her adult life; she worked at Polaris for a short time. Lola loved gardening. She kept an immaculate yard and had many flowers. For many years she crafted woven rugs, which she sold at flea markets. Each spring Lola anxiously waited for the blueberries to ripen. One year she picked about 45 ice cream pails of blueberries and sold them to people she knew. She loved to dance and she loved the Roseau County Fair. Her dog, Baby, was her pride and joy. Lola is survived by her sister-in-law, Lorraine Otto and several nieces and nephews. She was preceded in death by her parents; husband, Elvin; three infant sons and her daughter, Marlene; and by her eleven siblings.